With Lister's gone from the town, the old factory site looks empty and desolate. The hope is that when the new housing arrives, which it undoubtedly will, then at last there will be some new life in the area, though unfortunately not the manufacturing and employment base which it once was. The Priory is also empty, devoid of the Lister offices and awaiting a new life as separate apartments. At Cam & Dursley station, the site has been expanded to include more parking. It's a good sign that the station is being increasingly used, taking many commuters to Gloucester, Cheltenham, Bristol and further afield and to a lesser extent, bringing others to the local area. Part of the old Lister's cycle shed which would once have been filled with hundreds of bicycles when the company was in its heyday, now sadly silent. At long last the parking facilities have been expanded though it's still too little to accommodate the number of people who wish to use the station. No longer home to the head office of Lister's, the Priory is planned to have a conversion into 16 individual apartments, though probably not for at least a year. The beams of the roof are clearly seen in this view inside the Priory roof space. This wonderful wooden panelled room in the Priory was once home to the board room of R.A. Lister. Another view of the old board room in the Priory, this time towards the door. 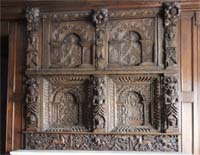 Above the fireplace in the old board room is this very intricate carving. Surprisingly the Priory was also once home to two public houses, the Railway Inn and the Lamb Inn. 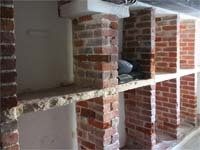 This views shows part of the brickwork where the beer would have been kept behind the bar, most likely that of the Lamb Inn.